Q: Why did you make this record now? A: Now is the right time. I’ve been thinking about it ever since I heard Willie [Nelson]’s Stardust record in the late 1970s. All through the years, I’ve heard these songs being recorded by other people and I’ve always wanted to do that. And I wondered if anybody else saw it the way I did. I love these songs, and I’m not going to bring any disrespect to them. To trash those songs would be sacrilegious. And we’ve all heard those songs being trashed, and we’re used to it. In some kind of ways you want to right the wrong. The great shock here, then, is Dylan’s singing. Dylan’s focus and his diction, after years of drowning in sandpaper, evoke his late-Sixties poise and clarity on John Wesley Harding and Nashville Skyline — also records of deceptive restraint and retrospect — with an eccentric rhythmic patience in the way he holds words and notes across the faint suggestions of tempo. It is not crooning. It is suspense: Dylan, at 73, keeping fate at arm’s length as he looks for new lessons, nuance and solace in well-told tales. ..But while Shadows In The Night is nostalgic, it is not sentimental. As a celebration of classic songcraft, it is as sincere as any of Dylan’s many forays into traditional American roots idioms. But how does Sinatra measure up to Dylan’s other early heroes? “Right from the beginning he was there with the truth of things in his voice,” Dylan wrote in the days after Sinatra’s death. “His music had a profound influence on me, whether I knew it or not. He was one of the very few singers who sang without a mask.” Shadows In The Night, then, is Dylan’s way of saying thank you. 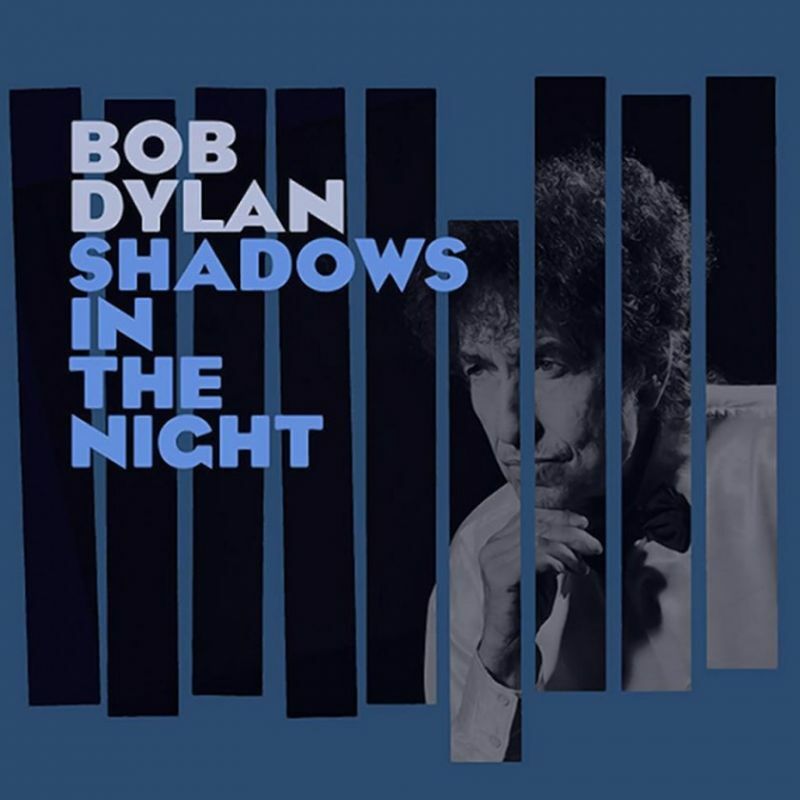 Capitol Studios, Los Angeles, U.S.
Shadows in the Night is the thirty-sixth studio album by Bob Dylan, released by Columbia Records on February 3, 2015. The album consists of covers of traditional pop standards made famous by Frank Sinatra, chosen by Dylan himself. On January 23, 2015, it was announced that 50,000 free copies would be given away to randomly selected AARP The Magazine readers. 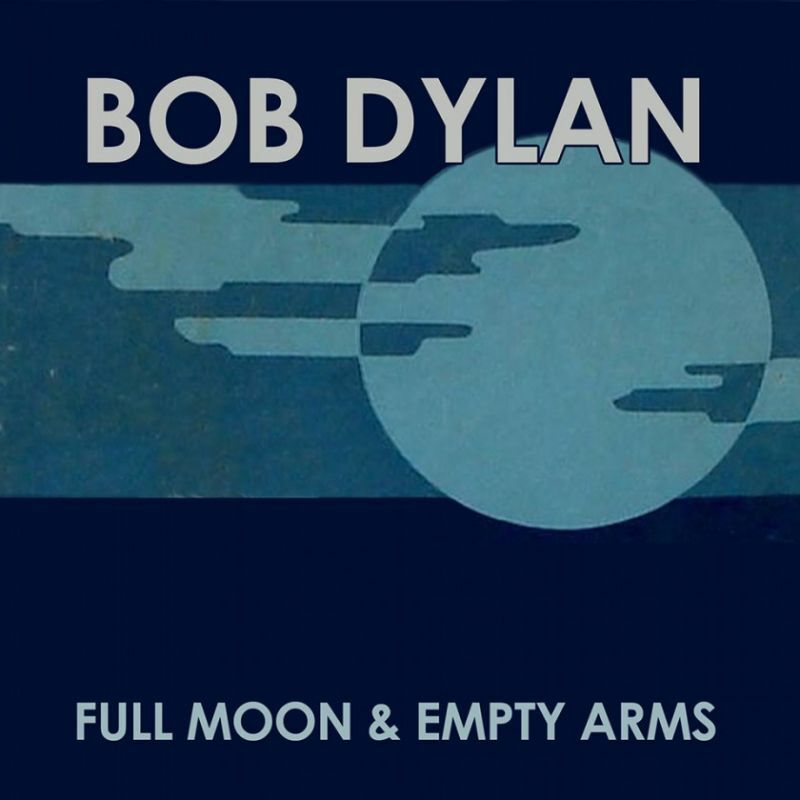 Prior to the album’s release, Dylan made “Full Moon and Empty Arms” available for free streaming online on May 13, 2014. The album has received positive reviews from critics for its unexpected and strong song selection as well as the strength of Dylan’s performance. Shadows in the Night consists of ten ballads that were recorded by Frank Sinatra in the late 1950s and early 1960s. 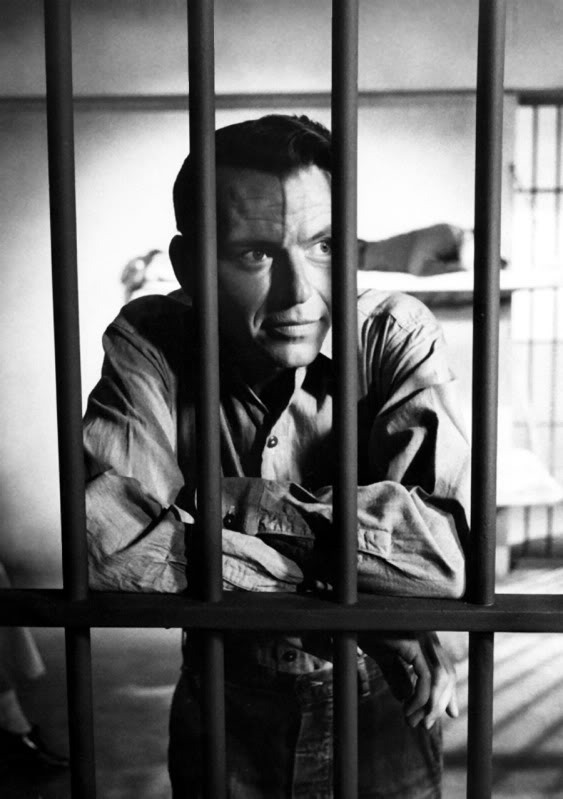 The songs were selected from that period of Sinatra’s career when he was recording thematic albums that explored emotions of separation and heartache—albums such as Where Are You? 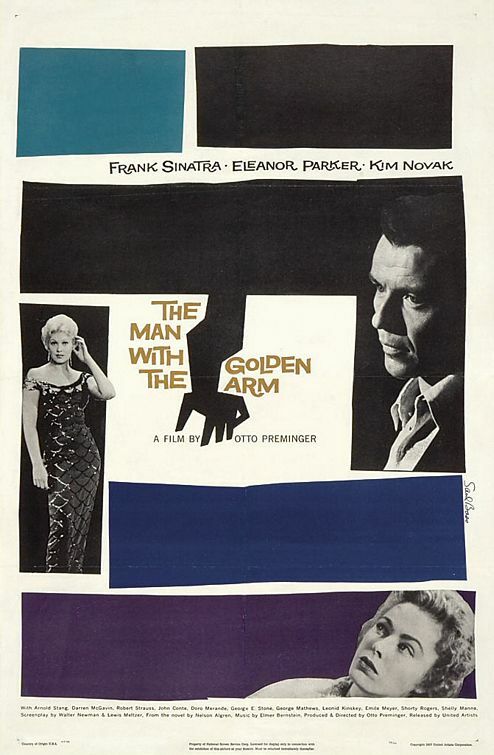 (1957), which includes four of the songs on Shadows, No One Cares (1959), and All Alone (1962). Most of the songs are Tin Pan Alley standards, delivered in a slow to mid-tempo pace, that “often luxuriate in melancholy” and communicate a sense of loneliness. The arrangements center on Dylan’s vocals supported throughout by Donny Herron’s gliding pedal-steel guitar and Tony Garnier’s bass. When you start doing these songs, Frank’s got to be on your mind. Because he is the mountain. That’s the mountain you have to climb, even if you only get part of the way there. And it’s hard to find a song he did not do … People talk about Frank all the time. He had this ability to get inside of the song in a sort of a conversational way. Frank sang to you—not at you. I never wanted to be a singer that sings at somebody. I’ve always wanted to sing to somebody. 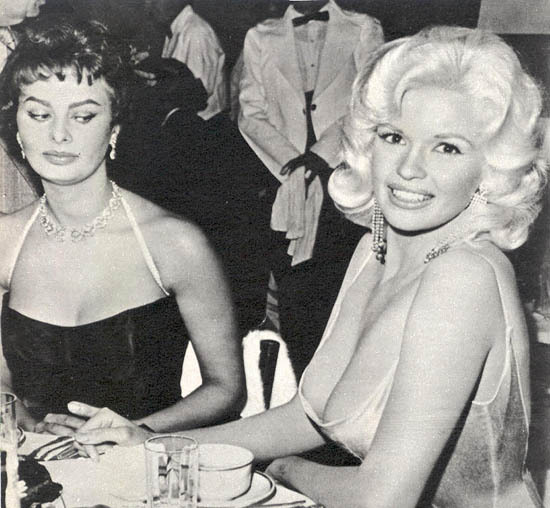 … Certainly nobody worshipped Sinatra in the ’60s like they did in the ’40s. But he never went away—all those other things that we thought were here to stay, they did go away. But he never did. Shadows in the Night was recorded in 2014 at Capitol Studios in studio B, where Frank Sinatra often recorded his albums. 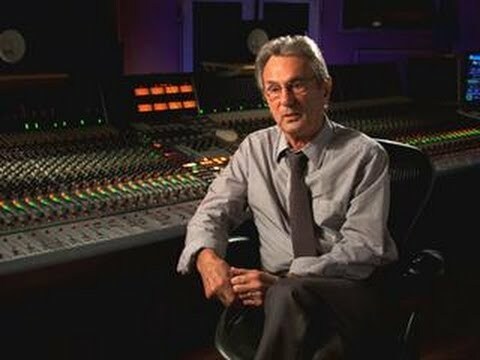 According to the album’s recording engineer, Al Schmitt, the songs on Shadows were recorded live with Dylan singing and his five-man touring band performing the songs in the same room at the same time without headphones. Dylan did not want to see any microphones other than the one he was using for his vocals, so Schmitt had to set up the rest of the microphones away from the instruments. The acoustic bass microphone was eight feet from the bass, and set down and away so it couldn’t be seen; the same approach was taken for the acoustic guitar. For the electric guitar and pedal steel, Schmitt placed the microphones close to the amplifiers, which were set off to the side. He would listen to the songs over and over and get Sinatra’s intention on what he was doing with the song. Then he would only do two or three takes on each tune, but he would make it his own. It had nothing to do with Sinatra. He’d just learn what the song was about and whatever. It was an interesting way to work. A total of 23 songs were recorded, from which ten were chosen for the album. Recording studios are filled with technology. They are set in their ways. And to update them means you’d have to change them back. That would be my idea of upgrading. And this will never happen. As far as I know, recording studios are booked all the time. So obviously people like all the improvements. The more technically advanced they are, the more in demand they become. The corporations have taken over. Even in the recording studio. Actually, the corporate companies have taken over American life most everywhere. Go coast to coast and you will see people all wearing the same clothes, thinking the same thoughts and eating the same food. Everything is processed. The cover art for Shadows in the Night presents images and a design that evoke the early 1960s or maybe even the 50s. 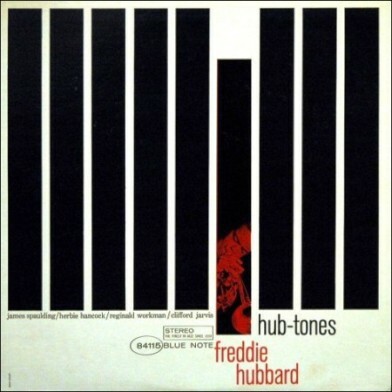 Blue Note has used a similar design on several albums. It also reminds me of the work of graphic designer Soul Bass, best known for his design of motion picture title sequences, film posters, and corporate logos. Bass also designed some of the most iconic corporate logos in North America. 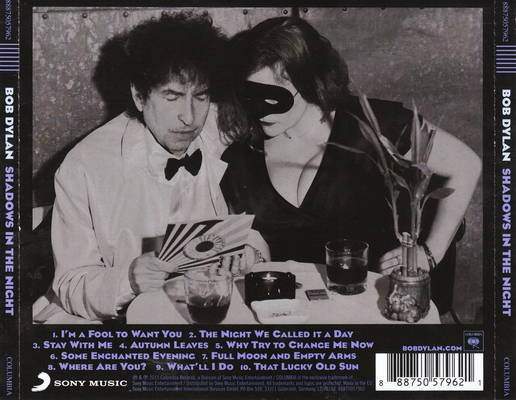 The back cover photo shows Dylan and a masked woman, both in formal wear, sitting at a small nightclub table looking at a seven-inch Sun Records single. 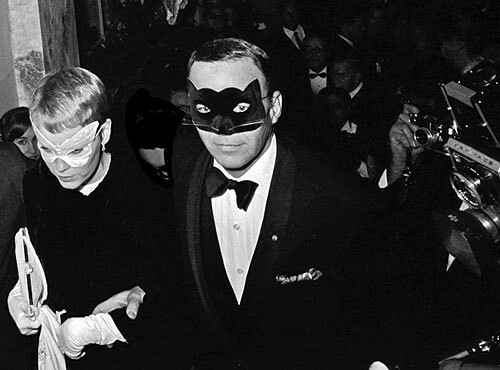 Their appearance may allude to the 1966 Black and White Ball, a masked ball attended by Frank Sinatra and his wife Mia Farrow, both of whom wore masks at the event. As with many of Dylan albums of the past fifteen years, the packaging features minimal credits and no printed lyrics. The title of the album, Shadows in the night, make me think of movies in black and white. Cinema is after all a play with light and shadows. It also makes me think of Chinese shadow puppet theater. It makes me think af Film-noirs with Jazz soundtracks. The album is about things happening in the dark. Most of the songs, if not all, has been on soundtracks. Perhaps it isn’t just a “Frank Sinatra cover album” maybe it’s a collection of songs used in cinema, tv and musicals? These songs have been written by people who went out of fashion years ago. I’m probably someone who helped put them out of fashion. But what they did is a lost art form. Just like da Vinci and Renoir and van Gogh. Nobody paints like that anymore either. But it can’t be wrong to try. So a song like “I’m a Fool to Want You” — I know that song. I can sing that song. I’ve felt every word in that song. I mean, I know that song. It’s like I wrote it. It’s easier for me to sing that song than it is to sing, “Won’t you come see me, Queen Jane.” At one time that wouldn’t have been so. But now it is. Because “Queen Jane” might be a little bit outdated. It can’t be outrun. But this song is not outdated. It has to do with human emotion, which is a constant thing. There’s nothing contrived in these songs. There’s not one false word in any of them. They’re eternal, lyrically and musically. This is an album that divides us here @ alldylan.com deeply. I’ve been beating Hallgeir with a large baseball bat daily for weeks now, and he still won’t come to his senses. Lovely album. Great vocal performance on most songs, tight band, smooth sound & interesting theme. That said, I can get a bit bored if I listen through the whole CD in one sitting. An album side however is perfect. WARNING – If you love this album, please feel free to ignore Hallgeir’s filthy words below. I was one of the sceptics when I heard he was make an album of Sinatra covers, I’m not a big fan of crooners. I can like one song at a time, but I never play through a whole Sinatra album. That said, when I hear a single song on the radio, I can enjoy it. The album? Well, I think I like almost all his other albums better than this one. There are a few stand-outs, but overall I find it boring. I miss a solid rhythm section and a more rock’n roll sound. The whole record sounds the same, very sugary and very boring. Bob Dylan sings good. 1. I’m a Fool to Want You Egil 5 Great start. Lovely crooning. Great song. 2. The Night We Called It a Day Egil 4 Nice song. Dylan vocal performance varies from ok to strong. 3. Stay with Me Egil 5 Strong vocal performance. Good Song. Even better live on several occasions. 4. Autumn Leaves Egil 6 Great song, GREAT vocal performance.. Brilliant. 5. Why Try to Change Me Now Egil 4 Great song. Solid vocal performance. 6. Some Enchanted Evening Egil 4 Good song. Again a solid performance by Dylan. 7. Full Moon and Empty Arms Egil 5 Good Song, Great vocal, perfect band performance. 8. Where Are You? Egil 3 OK song, Solid Vocal, but probably the weakest song on this album. 9. What’ll I Do Egil 6 Love this song & we get a GREAT performance by Dylan, Aces! Shadows In The Night should be remembered as one of Bob Dylan’s greatest albums that extends the story of American music he began telling us with Self Portrait that carried through the albums Good As I Been To You and World Gone Wrong. It’s not rock and roll. It’s not party music, but Shadows In The Night is better than I can find words to convince with. It makes me think that anyone else who’s been thinking of putting out a record this year should just close up shop, go on vacation and wait until 2016. The light that shines out of Shadows In The Night is blinding. When Dylan flexes and fires on all cylinders like this, nobody else has a chance. ..Dylanologists could doubtless tell you a lot about the relationship between the songs here and his own oeuvre: you suspect they’ll have a field day with the religious overtones of Stay With Me. To say that all seems besides the point isn’t to rubbish their close reading and study, which at its best is genuinely illuminating. It’s merely to suggest that Shadows in the Night works as an unalloyed pleasure, rather than a research project. It may be the most straightforwardly enjoyable album Dylan’s made since Time Out of Mind. He’s an unlikely candidate to join the serried ranks of rock stars tackling standards: appropriately enough, given that Frank Sinatra sang all these songs before him, he does it his way, and to dazzling effect. Dylan has made a saloon song album with a band that could be heard at a saloon: just a guitar quintet, taking a moment to breathe, sigh, and perhaps weep. 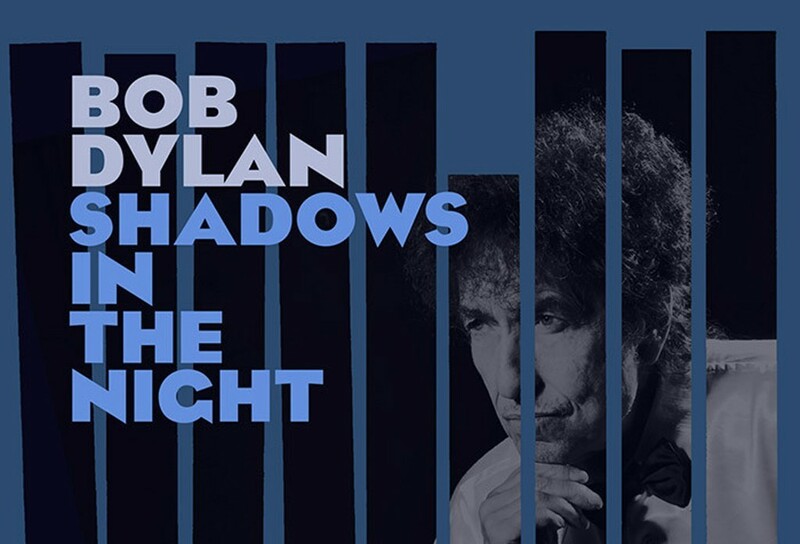 The fact that the feel is so richly idiosyncratic is a testament to just how well he knows these tunes, and these slow, winding arrangements are why Shadows in the Night feels unexpectedly resonant: it’s a testament to how deeply Dylan sees himself in these old songs. Making the most of Capitol’s Studio B — a Los Angeles landmark where Sinatra recorded — Dylan captures his band live, with stirring intimacy. As curator, he gets credit for avoiding obvious hits like “Stardust” and “Fly Me to the Moon,” instead picking “Why Try to Change Me Now?” and the show-stopping closer, “That Lucky Old Sun,” an old sufferer’s plea for relief. It’s one that Dylan clearly relates to and, over tasteful brass, the erstwhile bard of ’60s counterculture lets some elderly rawness creep in, singing like a guy who has seen it all and found truth in timeless poetry that belongs to everyone.